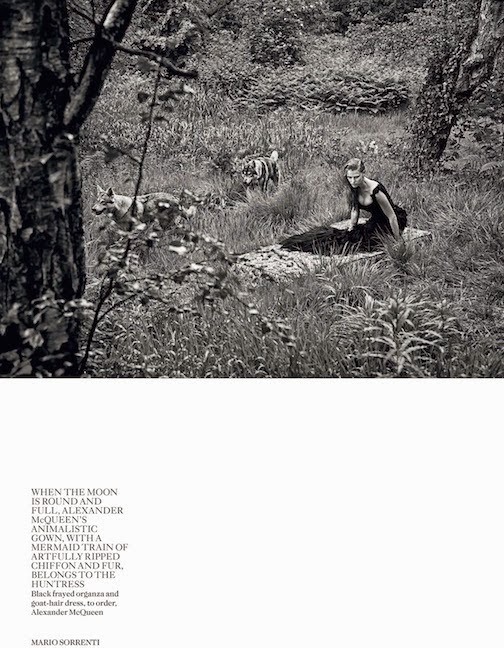 Lara Stone by Mario Sorrenti for VOGUE UK, SEPTEMBER 2014 in "the wolf in her". Kate Moss styled Lara in Alberta Ferretti, Dries Van Noten, Givenchy by Riccardo Tisci, Sergio Rossi, Whitaker Malem, Chloé, Christopher Kane, Alexander McQueen, Roberto Cavalli, Donna Karan New York, Emilio Pucci, and Versace. Photos: Mario Sorrenti for VOGUE UK via Mo.Mo.